Effect of insulin on glucose uptake and metabolism. 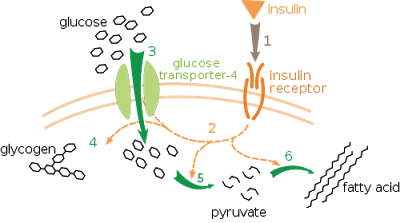 Insulin binds to its receptor (1), which starts many protein activation cascades (2). These include translocation of Glut-4 transporter to the plasma membrane and influx of glucose (3), glycogen synthesis (4), glycolysis (5) and fatty acid synthesis (6). Studies show that three genes, TBC1D30, KANK1 and PAM , may have an influence on abnormal insulin production which may predispose people to diabetes. Insulin is a hormone that brings sugar (glucose) to the cells for energy storage. It is produced by beta cells found in the pancreas. It is responsible for regulating carbohydrate and fat metabolism in the body. Insulin causes cells in the liver, skeletal muscles, and fat tissue to take up glucose from the blood. When insulin fails to do its job, glucose which is supposed to be stored in cells end up in the blood. As this progresses, blood sugar levels start going up leading to complications such as heart attack or kidney failure. Diabetes is a disease where the insulin in the body is either rejected or too low. There are two types of diabetes, Type 1 and Type 2. Type 1 diabetes is a disorder where the immune system of the body starts attacking and destroying the insulin producing beta cells. Type 2 diabetes is when the insulin produced is too low or that the cells start rejecting its own insulin. This is the most popular of the two types and accounts for about 95% of diabetes cases. In research published online Dec. 23, 2012 in the journal Nature Genetics, scientists have found three new and relatively rare genetic variants that influence insulin production, offering new clues about the genetic factors behind diabetes..
"Studying genetic variants — even rare ones — helps us learn how genes affect health and disease," said Karen Mohlke, PhD, one of the study's senior authors and associate professor of genetics at the University of North Carolina School of Medicine. "In this study, we've implicated new genes as playing a role in insulin processing and secretion." The study is also the first time genetic insights have been reported using exome array genotyping, a new tool that is less costly than genetic sequencing. This analysis allows scientists to quickly screen DNA samples for known variants in specific genes. It is especially helpful for testing variants that are rare. "The exome array allowed us to test a large number of individuals — in this case, more than 8,000 people — very efficiently," said Mohlke. "We expect that this type of analysis will be useful for finding low-frequency variants associated with many complex traits, including obesity or cancer." The scientists pulled data from a large health study directed by researchers at the University of Eastern Finland. A research team including postdoctoral scientist Jeroen Huyghe at the University of Michigan, Ann Arbor led the statistical analysis, which integrated genetic data and detailed health records for a sample of 8,229 Finnish males. Diabetes, which affects more than 25 million people in the United States, results from problems with the body's ability to produce or use insulin. Rather than pinpointing one gene behind the disease, scientists believe there are a whole host of genes that interact with health and lifestyle factors to influence a person's chances of getting the disease. The study revealed that certain variants of three genes — called TBC1D30, KANK1 and PAM — are associated with abnormal insulin production or processing, even in people without diabetes. The genes may predispose such individuals to developing the disease. As a next step, the researchers plan to continue to investigate how these genes may lead to diabetes. They also expect the results will inspire other scientists to use exome analysis to look at the genetic factors behind other complex diseases.